This Saint was born in Corinth in 448. 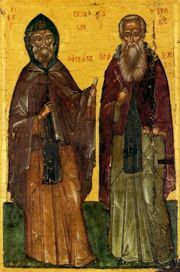 He went to Palestine to the Lavra of Euthymius the Great, but because of his youth was sent by Saint Euthymius to Saint Gerasimus; after the death of Saint Gerasimus he returned to the Lavra of Saint Euthymius. Later he took on a more rigorous life of asceticism in the wilderness of Natoufa, where there was nothing to eat except the exceedingly bitter wild herb called squills, which, however, through his prayers, God made sweet for him and his disciple. He lived 107 years and reposed in the year 555. The sacred lavra doth at all times rightly honour thee as a sure helper and support and mighty champion, and it annually observeth thy holy mem'ry. And since thou, O righteous Cyriacus, dost possess boldness with the Lord, protect us from our enemies, that we may cry to thee: Rejoice, O thrice-blessed Father. Share the feast of Cyriacus the Hermit of Palestine with an icon greeting ecard.